Sandhill Crane in flight, Bosque del Apache NWR, San Antonio, NM. From the recently concluded Bosque IPT. This image was created with the tripod-mounted Canon 800mm f/5.6L IS lens, the 1.4X III TC, and the EOS-1D Mark IV. ISO 400. Evaluative metering +1/3 stop off the grasses: 1/800 sec. at f/8 set manually. Central Sensor (by necessity) Rear Focus/AI Servo AF active at the moment of exposure. Click here if you missed the Rear Focus Tutorial. Lens/TC/camera body Micro-adjustment: +4. For a greater appreciation of the image, click on the photo. Then click on the enlarged version to close it. Most times when I clip off the end of a wing or wings so severely that repairing the missing primaries is impossible, I simply delete the images. But there are times when I think, “Jeez, that is so sharp with so much detail, there must be a way to do something with it.” So following the principles detailed in the Advanced Composition and Image Design section in The Art of Bird Photography II (ABP: 916 pages on CD only), and following my own advice from the same source: “cut don’t clip,” I hit C for the Crop Tool for all of the images presented in this post and went to work. For the image above a quasi pano-crop worked best. Note that rather than clipping the primaries I chose to cut them dramatically while cropping from the top and the bottom. Having the eye wind up in the upper right corner worked very well. Snow Goose, adult braking hard, Bosque del Apache NWR, San Antonio, NM. From the recently concluded Bosque IPT. This image was created with the tripod-mounted Canon 800mm f/5.6L IS lens, the 1.4X III TC, and the EOS-1D Mark IV. ISO 400. Evaluative metering +1/3 stop off the grasses: 1/1600 sec. at f/8 set manually. With the image above it would have been possible to repair the wing tips as I barely clipped the primaries top and left. That, however, would have been a lot of work and adding the needed canvas would have made the task that much more difficult and time consuming. So I opted to crop from all sides in order to wind up with a balanced image that showed more detail. Again, note that “cut don’t clip” was the best road to follow. 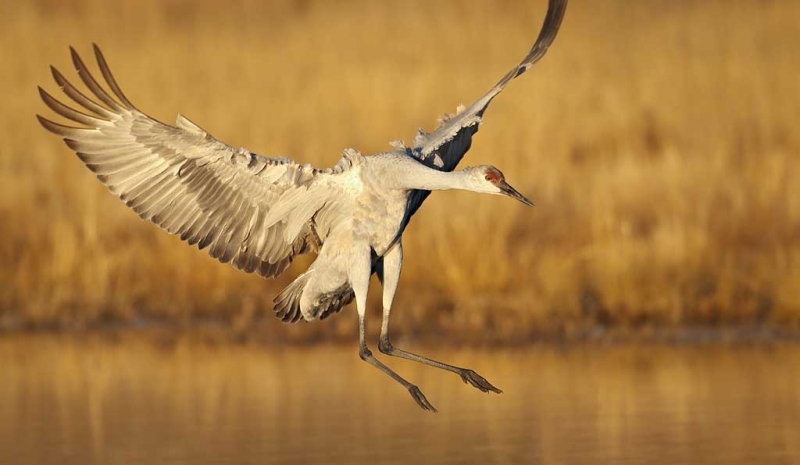 Sandhill Crane, immature landing, Bosque del Apache NWR, San Antonio, NW. From the recently concluded Bosque IPT. This image was created on the morning of 11/23/2011 with the tripod-mounted Canon 800mm f/5.6L IS lens and the EOS-1D Mark IV. ISO 400. Evaluative metering +1/3 stop off the grasses: 1/1600 sec. at f/6.3 set manually. With the legs well forward and the great sharpness in the image above there was no way I was deleting this one because of the clipped primaries on the far wing so I took a bit off the top, cropped from the bottom, and then Quick Masked out the backs of the two birds in the bottom of the frame. 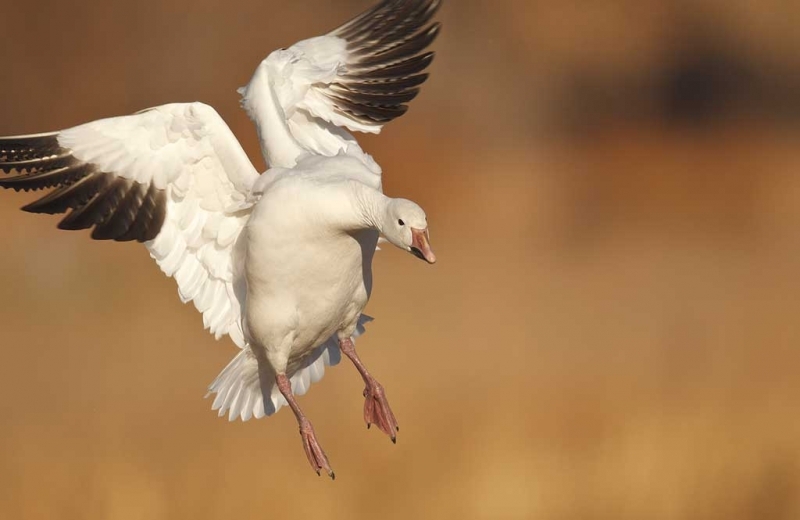 Snow Goose, immature landing, Bosque del Apache NWR, San Antonio, NW. From the recently concluded Bosque IPT. This image was created on the morning of 11/18/2011 with the tripod-mounted Canon 800mm f/5.6L IS lens and the EOS-1D Mark IV. ISO 640. Evaluative metering +1 1/3 stops off the low blue sky: 1/1000 sec. at f/5.6 set manually. In the image above I loved the sharpness and the super detail afforded by the tight framing. By checking out the original capture below you can better understand the thought processes that go into making these unusual crops successfully. I invite you to leave a comment and to share your thoughts on these unusual crops. Do they all work for you? Do you have a faveorite? Would you have done anything different? I do like all of them :). BOSQUE del APACHE 2012 IPT: “The Complete Bosque Experience.” NOV 21-27, 2012. 7-FULL DAYS: $3299. Introductory Slide program: 6:30 pm on 11/20. Limit: 12/Openings: 10. Tens of thousand of Snow Geese, 10,000 Sandhill Cranes, ducks including point-blank American Wigeon and Wood Duck, amazing sunrises, sunsets, and blast-offs. Live, eat, and breathe photography with one of (if not the) world’s premier photographic educators at one of his very favorite locations on the planet. Top-notch Photoshop instruction. Next year will make 18 consecutive Novembers at Bosque for me. Nobody knows the place better than I do. Join us to learn to think like a pro, to recognize situations and to anticipate them based on the weather, especially the light and the wind direction. Every time we make a move we will let you know why. When you head home applying what you learned will prove to be invaluable. Hi Artie. IMHO, the first shot (sandhill crane) is too far to the right of the frame to keep my interest and the up-curved primaries too OOF (I’d keep it for teaching a birding class but not for sale). Might have been much better if the left wing (which leads in this image) were entire and the right wing was cut. All other images are spot-on. Thank you for sharing. I absolutely love them all. I have PS’ed additional backgrounds and primaries more times than I care to think about! But now you’ve given me the courage to not dismiss an otherwise nice shot, and edit less. Chopping off the wings a bit often gives a greater feeling of immediacy. When everything is all evenly spaced out, things can get kind of remote and overly formal feeling. Artie, I think the crops are fine but I do have a question on exposure. I noticed that the first 3 images all were metered off the grass and you added 1/3 stop to each exposure. When I look at the background, I would normally meter at 0 but I was wondering if you were adding the 1/3 stop for ETTR (exposure to the right)? Hey Artie! Interesting to see your shots getting more like mine! Neither of the crane shots work for me – the first one with the bird heading straight out of the frame; the second crane shot looks like a wing clip, not an intentional cut, so isn’t convincing. On both images I have asked myself if the image would be better without the cut and on both images I have thought “yes, they would!” First Snow Goose works for me as it seems to be landing into the frame and this is accentuated by the clip/cut on both wings – so the image is improved from it. 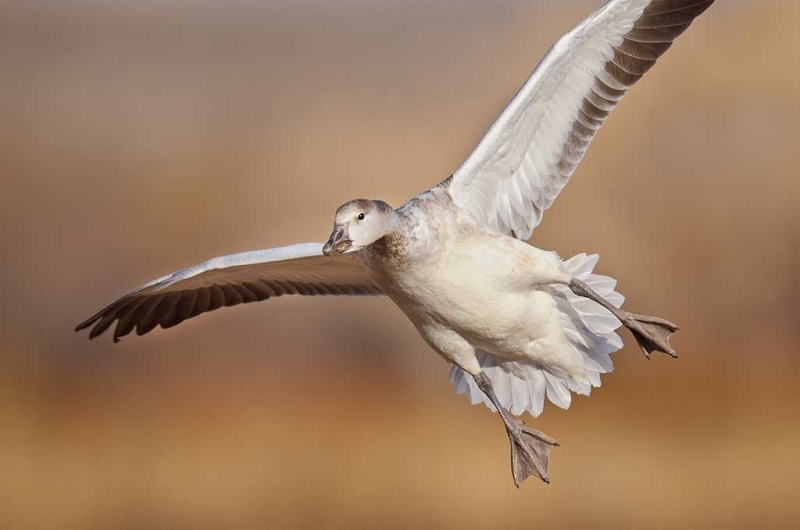 But the second Snow Goose, although it is beautiful, doesn’t seem to me to have that same dynamic / glide path and the clip doesn’t add but makes it look like one of mine! Nice crops! Like David P., the first one is the only one that doesn’t sit with me. I think it is because the tip is on the way out of the pictue, whereas in the other pix they are entering the pic. Artie: Thanks for this. Cropping remains the single most important editing tool, IMHO, and your examples make a nice tutorial. I often have similar problems, partly because I persist in using my beloved Canon 400 mm f/5.6L, and sometimes I do lose parts of wings or feathers. And sometimes I like to crop anyway, as you did, to emphasize some features. I like all your crops very much except the first one, and there my response is simply that cranes are so abundant, so large, and fly so slowly (relatively) that there’s less reason to accept less than perfection. The asymmetry in that crop–the left wing cropped, but not the right–does bother me a bit and I don’t find the photo so compelling that it was completely worth it anyway. For most of us mortals it’s a great shot, but not quite for you. For all the rest, I do like the crops very much as you did them. I personally don’t mind that portions of the wings are cut as long as the image holds together. Thanks for illustrating that images can be saved in this manner. On 10-20-11, I posted an image on bpn for the theme (landing and takeoff) of a great blue heron coming in to the nest with a cut wing (currently page 11 on bpn). I had pointed out that it was an unconventional image with the cut wing, but received the usual boilerplate comments about wanting perfection in wing feathers. I’d appreciate your comment on this image if you have the time. Hi Artie. Personally I like some photos to be partially cropped like these. they look very natural in a realistic world. It is difficult to take everything in anyway when at a place like Bosque. 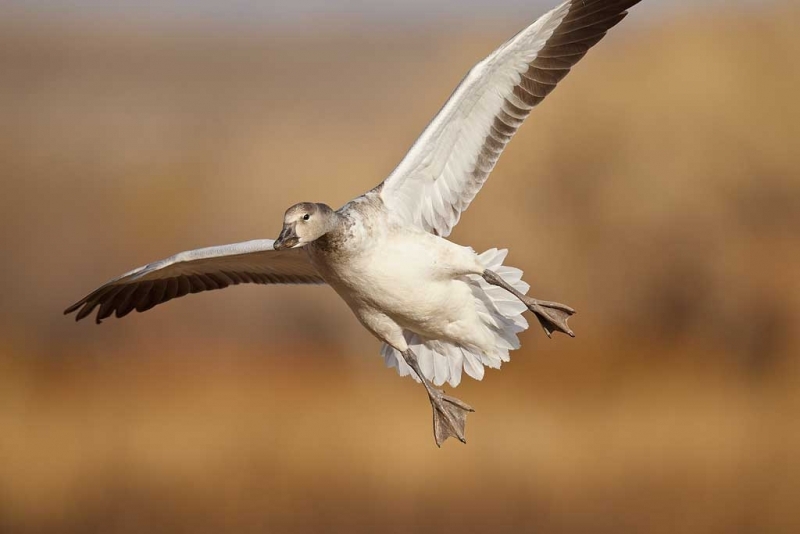 This leaves something to the imagination – what else is there to see beyond that one goose?